One of the greatest contributors to FIRESTORM FAN is Jon from FIZZIT, the Firestorm-themed blog. Jon has been extremely generous allowing us to publish scans of his art collection, including original Firestorm pages and tons of convention sketches. In fact you can view scans of his entire art collection online by clicking here. Yes, Jon has been a huge friend to FIRESTORM FAN. But I’ll let you in on a little secret. Shhhh.. don’t tell anyone..
Oh well, I guess today we’ll look at some more really friggin’ cool original drawings owned by stinkin’ Jon. 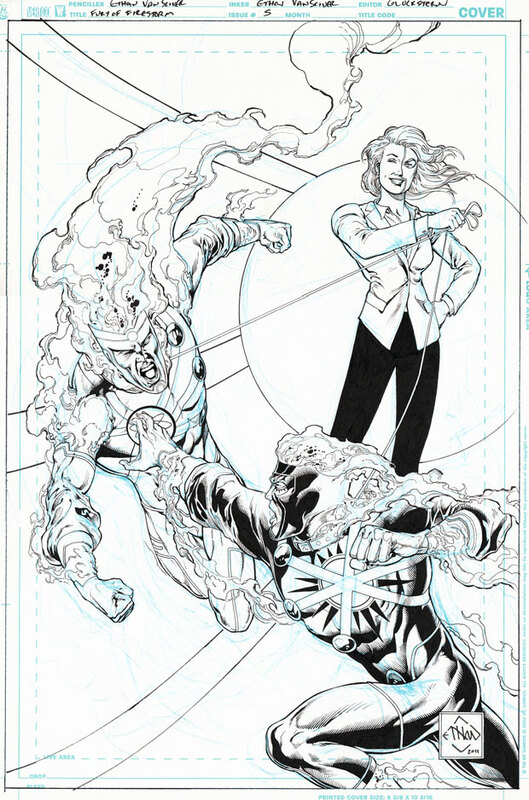 First up is the original artwork to Ethan Van Sciver’s cover for The Fury of Firestorm: The Nuclear Men #5! A seriously impressive find! Jon mentioned this drawing works better in black and white, and I’m inclined to agree with him. Click the image to enlarge so you can see Van Sciver’s amazing detail. Next up is Ethan Van Sciver’s gorgeous cover to The Fury of Firestorm: The Nuclear Men #6. This is one of my all-time favorite Firestorm covers! The interesting story about Jon buying this piece is that he and I were bidding against each other on eBay for this! Too funny! That lucky devil Jon won the auction. 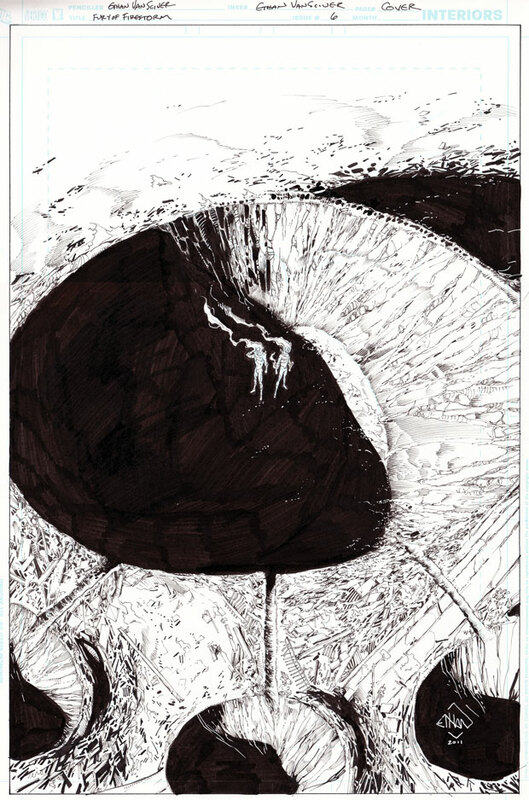 *grumble* *grumble* Click the image to enlarge so you can see Van Sciver’s amazing detail. Support Firestorm (and Jon, who I don’t like)! Fan the flame! Posted in: Ethan Van Sciver, Firestorm #09: New 52 v1 (Firestorm Protocols), Firestorm comic vol. IV, Jason Rusch, Ronnie Raymond, Sketch/Art. To be honest, I don’t particularly like Firestorm. I just buy stuff because I don’t want you to have it, Shag. That looks toatally sweet! Your a lucky man Jon… You know, I live in New Zealand too… Where do you live Jon??? #6 is so brilliant and subtle. @Keith – I’ll be sending you an address with specific instructions. Operation: Match-head is GO! @ Martin Stein RIP – So true! The symbol in the ground is brilliant! ha, as an indie comix wonk, i’m a noah van sciver fan, and i always forget his brother is usually considered the main event.